All three of the big southern hemisphere nations, including the unbeaten All Blacks, struggled at times during the autumn internationals. I believe the main reason for this was because they battled to generate quick, front-foot ball at the breakdown. In Europe, the tackle-assist is allowed to go lower and almost doesn't support his feet. Thus, cleaning a northern hemisphere player is invariably harder than cleaning one from the south. The All Blacks, though, boast better ball-carrying technique than both the Springboks and Wallabies. The forwards from the latter two teams carry the ball in front of the body, whereas New Zealand's forwards run tall akin to their backline players for as long as possible and only lead with the body when they realise they won't have freedom or space in the collision. If the tackle is effective, the ball gets placed further away from the opposition when the carrier goes to ground. However, if the tackle isn't effective, the ball-carrier is able to offload. The Bok and Wallaby forwards also tend to drop their heads, and with that their eyes quickly, so the opposition know they are going to carry, while you are never really aware when an All Black is going to do so. An All Black will carry later, once he realises there's no space or a weak shoulder. 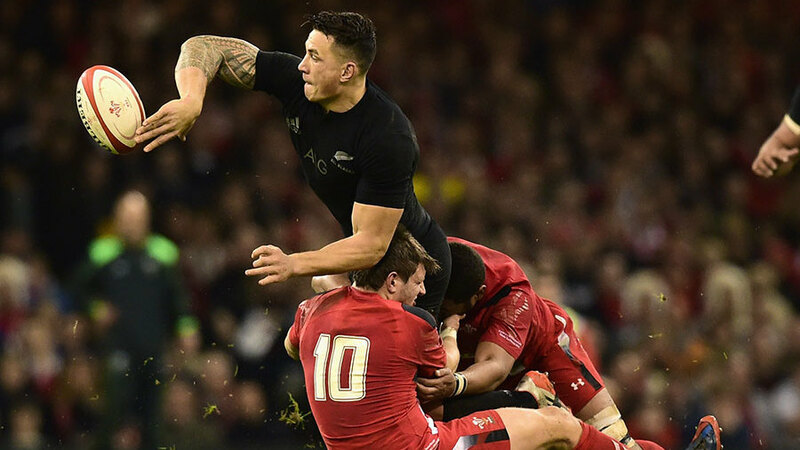 In addition, the All Blacks stay tall for as long as they can, and the effectiveness of the tackle determines whether they offload or take the ball to ground. I found the offload stats for the autumn internationals very interesting. Research shows that Ireland didn't make a single offload during their convincing win over South Africa. The All Blacks made 15 offloads in beating England, while Stuart Lancaster's men made 18 offloads over all four Tests. England may offload more than Ireland do, but that's because they don't carry the ball as well - they tend to be a bit taller in the tackle and too square. Keeping ball before body invites two defenders. Meanwhile, Joe Schmidt's Ireland like to keep the ball on the tackle line, put body before ball and dominate the collisions. Those tactics worked well from them against South Africa, but if there was no traffic pre- and post-tackle line, they would try to keep the ball alive by offloading in the tackle. Sonny Bill Williams is the best offloader in the oval game, because he stands tall at 1.91m and he also runs tall. Furthermore, he has the ability to fend off the defender to give himself the space to offload in contact, and because he has thumb grip on the ball, he possesses the ability to pass it out the back of his hand or bring it back as he has bought time with the fend and the thumb is securing the ball. In addition, what sets the All Blacks apart from the chasing pack, for me, is that first and foremost the passer supports his pass subconsciously and they run better support lines than any other team. They look to make the defender advance, which is why they tend to go to the side rather than T-bone the defender. They also arch run on kick receipt returns. Generally defenders look to control the attack on the inside shoulder and when the defender advances too early he puts himself in a weaker position. If the attacker takes the defender off his defensive line, it creates a hole where the defender came from. The support runner then provides support from behind the ball, as do the men on his outside, and the four All Blacks in close proximity to the ball carrier attack that channel, get in behind the defensive line and keep the ball alive for as long as possible before shifting it to new space or side that has more numbers than defence. The Springboks would not have expected to lose to both Ireland and Wales, having won all of their end-of-year tour matches under Heyneke Meyer in 2012 and 2013. However, the forced introspection could make them a better team going forward. Ultimately, I believe that South Africa's destiny at the World Cup will be determined by selection and getting the right players in key positions. As far as the Wallabies are concerned they endured their worst end-of-year tour since 2005, losing three Tests from four. However, I don't believe it will have much impact on their psyche with the World Cup in mind. The Wallabies have a 51 per cent all-time win rate in Test rugby and thus aren't affected as much by defeats as the All Blacks and Boks, who are expected to win every match played. Wales and England were able to exploit the Springboks and Wallabies' other deficiencies in their respective Tests last Saturday. The Bok scrum was inconsistent in Cardiff. Moreover, they struggled to exit with momentum as there weren't any lengthy or bringing-forward kicks. The South Africans almost always opted for the box kick from the wide ruck. You never once saw the Springboks exiting with a kick or run after going wide to bring the open wing into the defence line and force the fullback into last man defender early. Their exit plays are very predictable, while the Wallabies take a bit more risk in that regard. However, Australia's scrum weakness was exploited once again by England, whose two tries stemmed from dominant set-pieces. The Wallabies were also exposed at kick receipts, with England drawing poor catch crumbs from Henry Speight and bringing Israel Folau forward, as well as then kicking in-behind him and forcing him to turn around.